My 6th premiere screening of the year 2013. First of all, thank you Nuffnang for the invitation. And this will be my first premiere screening with my sister since she just started her new semester not long ago. 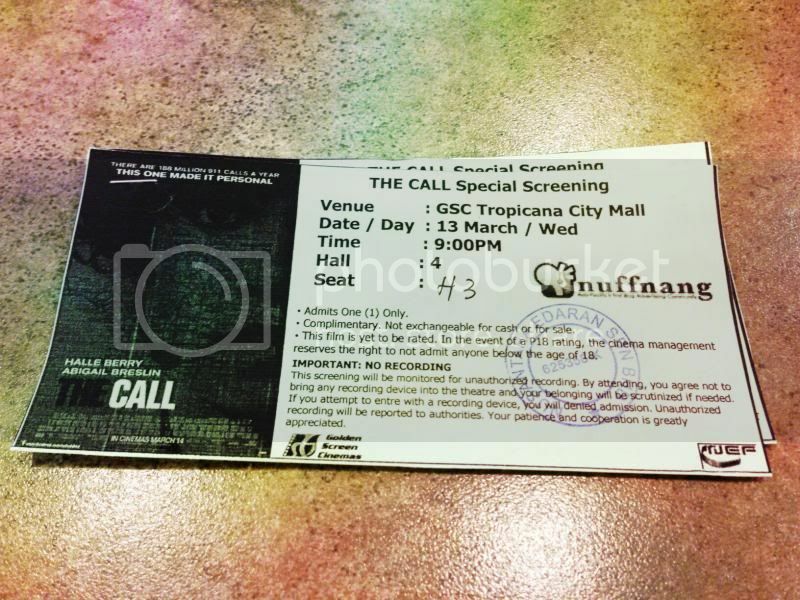 The Call is a thriller film starring Halle Berry and Abigail Breslin. Jordan Turner (Halle Berry) is a 911 operator who receives a call from Leah Templeton (Evie Thompson), a teenage girl whose house is being attacked by a serial killer (Michael Eklund). Jordan's clever instructions allow Leah to evade the killer, but when the call disconnects, Jordan redials the number, alerting the killer. The mistake results in Leah's capture, and she is found dead several days later. Jordan confides to her boyfriend Officer Paul Phillips (Morris Chestnut) that the event has put her in a mental state where she can no longer working as a 911 operator. Six months later, she is now a trainer for 911 operators. At this time, the same killer kidnaps another teenager Casey Welson (Abigail Breslin) from a mall parking lot and drives away with her in the trunk of his car. Autumn (Ella Rae Peck), a rookie operator, receives the call and clearly cannot handle it; Jordan sees this and takes over. Because Casey is using a disposable phone, they cannot get an exact GPS location of her. Jordan guides Casey into signalling nearby cars who call 911, allowing the police to narrow their search. The killer kills several citizens who intervene, and switches cars with Alan Denado (Michael Imperioli), one of his victims to elude the police. However, he inadvertently leaves fingerprints at the scene of the car switch, and the police are able to determine his identity, Michael Foster. Michael arrives at his location and finds Casey on the phone, mid-call with 911. After Jordan tells Michael that they know his identity, he smashes the phone. Paul realizes that Casey looks very similar to Michael's deceased sister. While their childhood home had been burned down (implied to have been arson by Michael), a nearby secondary house still stands. The police raid the house but find no one. Jordan is mentally anguished by a second failure to save a child from Michael, and visits the secondary home for clues. While there, she recognizes the sound of a flagpole from the final moments of the 911 call, and finds a trap door amongst the grass where the primary house used to stand. She goes in without calling the police. Combining clues from the second half of the film as well as observations of Michael in the cellar, his back story is put together. Michael had romantic feelings towards his sister and wanted to marry her (it is unclear if she reciprocated such advances). However, she contracted a disease as a teenager (most likely leukemia), lost all her hair, and died. Michael has a prop head that he treats like his sister, but he needs a replacement for her hair. He's apparently been killing many women who have hair similar to his sister's without the police realizing. He takes the scalps of his victims, but so far, none of the scalps have been correct, leading to repeated killings. Jordan finds Casey tied in the cellar. As Michael is about to scalp her, he shows some remorse for his actions but says he can't stop. Jordan attacks him, freeing Casey. Casey and Jordan fight against Michael and manage to knock him out. They tie him up in the cellar and then abandon him to die (without calling the police), using the cover story that Casey escaped and they don't know where Michael went. The plot is interesting but somehow is gory to me. The ending was a bit lame for me. Somehow I wish they can extend the plot longer as this movie only takes about 1 hour and 35 minutes. Anyway this plot gives me an important lesson - Do not simply make prank calls on 911 in Unites States (For Malaysia is 999). You might not know what will happen next! Watch this movie readers! I'll rate this 4/5.